summer—but it started me thinking about rainbows. They are caused by the sun’s light viewed through the rain which breaks out the colors of light to produce vivid arcs of beauty in the sky. The rainbow in mythology can symbolize anything from a promise such an in Christian mythology, to a bridge or road as in Norse mythology and ancient Greek mythology. Different cultures see different things in the rainbow such as a serpent in Australian aborigine mythology and the Hindu bow of the gods used to shoot lightning bolts. But one of my favorite rainbow stories is the Chinese folktale of Hsienpo and Yingt’ai. Yingt’ai was a young girl, known for her beauty and her intelligence. She loved to read and wanted to learn so much that her father disguised her as a boy so that she could study with Hsienpo, the son of their neighbor. The two became fast friends and Yingt’ai was careful not to expose herself as a girl to her friend or the other students. As they continued to study together and grow older, Yingt’ai found herself beginning to love her friend Hsienpo less like a best friend and more like a lover. Yingt’ai went home and as her father had died, told her sister-in-law that she wanted to marry Hsienpo. Her sister-in-law instead arranged a marriage for Yingt’ai with a rich local doctor, cutting off her funds to remain in school. As she was tearfully leaving school Yingt’ai tried to hint to Hsienpo that she was a girl, but he was oblivious and grieving for the loss of his friend and did not understand her hints. After several months, Hsienpo went to visit Yingt’ai, asking at her house for “Mr. Yingt’ai” only to be told that there was no “mister” only a “miss” who was about to be married. Crushed, he returned home and when searching through his school things found letters that Yingt’ai had left for him telling him how much she loved him. In despair he stopped eating, stopped going out, and finally died of a broken heart. and opened, Yingt’ai flung herself into it and the ground closed over her. Yingt’ai’s angry bridegroom had the grave exhumed but the lovers’ bodies were nowhere to be seen. Instead a rainbow shone overhead, and the people who saw it knew it was the lovers—Hsienpo in the red bands, finally reunited with Yingt’ai in the blue. How fitting that the rainbow symbolizes lovers who find happiness (the sun) despite sadness (the rain). And how fitting that the rainbow is the symbol of hope for equality among all orientations and identities. Each band is cherished for its color and its brightness. 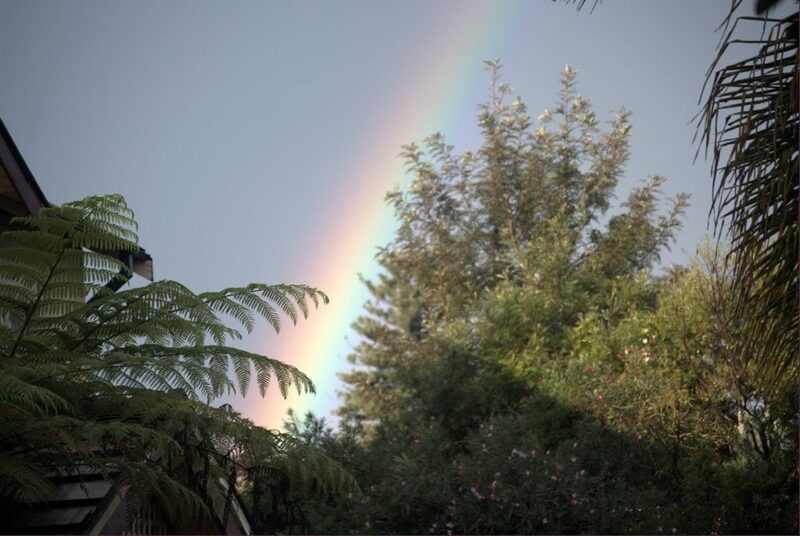 Each rainbow endures to shine amid the tears of rain, promising a new day for the world.